Whether your contracts are always inside IR35, always outside or a bit of both – here’s how you can maintain your flexibility as a contractor and easily manage any project with inniAccounts. Flexibility is the cornerstone of contracting. 78% of the UK public agree that becoming an independent professional is the best route to both increased flexibility in work and a better work/life balance. The role of a contractor offers flexibility in projects and clients but also in your lifestyle. It enables you to choose how you want to work and when to spend time on the other things that matter; such as family, travelling or training for the next big marathon. It’s no wonder the number of people choosing to ‘go it alone’ continues to increase every year. This increase, however, also brings ever-growing levels of competition. Not only is flexibility a perk of the job, it’s a requirement for the professional contractor looking to maintain their competitive edge. Those contractors who flexibly look for contracts both within the public and private sectors, who have the knowledge to negotiate their contract’s IR35 status and don’t see IR35 as an immediate deal-breaker to an otherwise attractive contract will always hold an advantage. Here at inni, we’ve worked to ensure every aspect of our service supports our clients need for flexibility. With inniAccounts, it’s easy to manage every aspect of any contract that falls inside IR35. From invoicing through to receiving payments; while keeping clear records that your tax and National Insurance have been correctly paid. Features built into our software allow you to handle any contracts inside IR35, as well as those outside of IR35, side by side with just a click of a button. It’s simple, efficient and accurate, take a look at our step by step guide to see for yourself. As with all dealings with regulatory and financial bodies, great record keeping and scrupulous collection of evidence is the best way to ensure you’re protected should your status ever come under scrutiny. Managing your contracts and business finances with inni, ensures you have everything you could need at your fingertips. Alongside our award-winning software, our team of expert Account Managers and Accountants are always on hand to discuss any inquiries in detail. There’s also our Twitter, Blog and Knowledge Hub where we’re continually discussing the ongoing impacts of IR35 as well as any other legislature changes that could affect contractors. With the public sector application changes here to stay and it looking more and more likely these changes will be rolled out to the private sector, it’s more important than ever that contractors have a grounded understanding of IR35 and are continually assessing what’s best for them. Should you choose to pursue a project that’s inside IR35, with a specialist accountant, managing your contract is an easy and straightforward process. Choosing a specifically tailored accountant, like inniAccounts, allows you to continue to enjoy complete flexibility in selecting your contracts while maintaining all the benefits of being the owner of your own limited company. Keeping track of your finances needn’t be stressful and time-consuming. We get that an accountancy service should make things accessible and hassle-free. 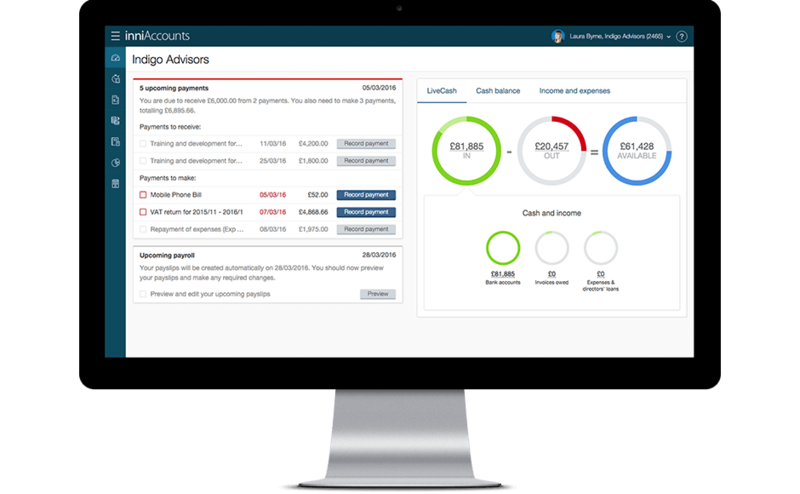 By combining innovative software and fast, personal service we’ve created a solution that makes managing your accounts easier and quicker than ever. You can find out a little bit more about our service here.